If you're visiting Washington State and would like to try your hand at prospecting, then you should first familiarize yourself with the state's gold panning laws. Suction dredging is now starting to become regulated throughout Washington State. For a while, there was no regulation here unlike some neighboring states. But this will no longer be the case because lawmakers are putting forth new bills that will regulate suction dredging. The mining claims in Washington State are all controlled by The Bureau of Land Management (BLM). 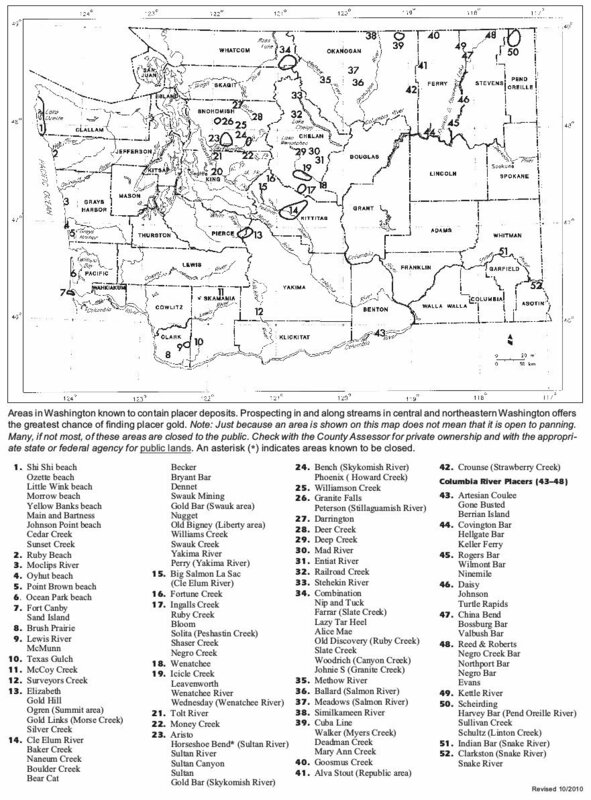 Of the 57,157 recorded Washington State mining claims, the BLM lists 2,312 as active. Panning on an active claim without the owner's permission is considered trespassing, even when done in ignorance. The locations of active mining claims can be found on the Bureau of Land Management's official website. During the late 1800s, gold was discovered in all counties of Washington State. Most of what was found was placer gold, but lode gold was discovered by a number of lucky panners. The following counties were particularly productive and are still popular today with recreational prospectors. Kittitas County is the heart of gold panning in Washington State. It was here, at Swauk Creek, that gold was first discovered back in 1873. Gold mining camps were established all over Kittitas County after the first find. Among these mining camps was the unincorporated community of Liberty, which went on to become one of the most productive sites in the area. Despite early success, Kittitas County prospectors were regularly disappointed. The area's gold production proved lower than that of other counties in Washington State. However, when gold was found there, it tended to be in the form of large nuggets. This made it more valuable than the placer gold of neighboring regions. Nuggets are still recovered from Kittitas County rivers on occasion, so determined prospectors can expect to be rewarded for their patience. Chelan County is home to the Golden King Mine, one of America's richest sources of lode gold. Because of this mine, Chelan County is the largest producer of gold in all of Washington State. In the late 1800s, additional lode mines sprung up throughout the county. This included one in Blewett, which is accessible today despite the town having long ago been abandoned. Even a novice prospector has a pretty good chance of finding placer gold in the rivers of Chelan County. The Wenatchee River in particular is a popular spot for panning. The Chelan County stretch of the Columbia River is also worth checking out. Skagit County's primary producer of gold is the river with which it shares its name. Although nuggets are extremely uncommon in this part of Washington State, small deposits of gold have been found throughout the Skagit River. Day Creek is also frequently panned by prospectors in Skagit County. The Lynam portion of Day Creek is especially rich and it's a regular source of placer gold. 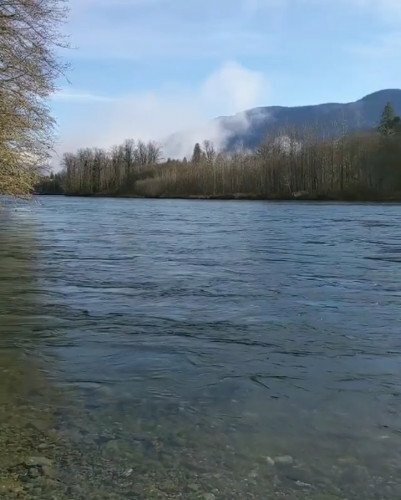 Whatcom County also has access to the Skagit River. In addition it's home to Ruby Creek, a tributary of the Skagit River, which runs through Whatcom County for all of its 3.39 miles. This creek is one of the largest producers of gold in the Cascade Mountains. The gold found in the Cascade Mountains is generally fine, but Ruby Creek gold is the exception to the rule. Ruby Creek prospectors have reportedly discovered large nuggets of gold in the area. Washington State can be good for gold panning. However there are better states out there. So if panning will be the sole purpose of your trip, then there are several nearby states more deserving of your attention such as Oregon or Idaho. But if you're visiting Washington State on business or with your family, then panning its rivers is certainly a fun way to spend some free time.